HUEY – Gilbert F. “Bud”, 76, of Liverpool, passed away peacefully at home with his family by his side on Wednesday, December 29th, 2010. Born in Milton, he was a son of the late Melbourne Huey and Marion (Whynot) (Huey) Lee. Bud was a former sheet metal worker for Steel and Engine (STENPRO) until his retirement. He was an honorary firefighter with the Liverpool Fire Fighters Association after serving 17 years as a regular volunteer fire fighter. He enjoyed playing softball and played with the Steel and Engine team and with the Liverpool Fire Fighters team. Bud enjoyed listening to guitar and country music, road trips, woodworking and yard work. Although Bud was a private person, he enjoyed the company of family friends. He is survived by his wife Judy (Whynot), his sons: Kenny (Michelle) of Hythe, AB and Shane of Bridgewater. His daughter Debbie Wolfe of Milton. His grandsons Lincoln Huey and Michael Wolfe. His nieces Krista Zwicker and Kim Mansfield, both of Liverpool and his great niece Evelyn and great nephew Ben Mansfield. He was predeceased by his step father Henry Lee. We want to send our condolences to you all,I know Bud will be missed terribly,not only by his family but also by all his friends.We are thinking of you all at this time. Our deepest sympathy to you Judy, Kenny, Shane and families. May the comforting words of family and friends get you through this difficult time. We want to let you know we are thinking of you in this great time of sorrow. Bud will be resting in peace now,no more pain.We know the grief you all will be going through. Our thoughts and prayers are with you during this time. Thinking of you at this very sad time.You are in our thoughts & prayers. Judy you took good care of Bud.Memories well live for ever. Dear Judy,Kenny,&shane,So sorry to hear of your loss,May god be with you all at this sad time..
We are so sorry for your loss, please find some strength in knowing that so many care and are near you at this sad time. To the family of Bud Huey I wish to send along my sincere condolences. Bud was a great guy and will be sadly missed by all that knew him, but he will never be forgotten! So sorry for your loss. Be there for each other and take care! Your friends and family are here for you. Judy, Kenny and Shane. We are so sorry to hear of Bud’s passing. Our Thoughts and Prays are with you all at this sad time. Sorry to hear about Bud, my thoughts and prayers are with you and your family. Dear Judy,Kenny and Shane.I was so sorry to hear of the great loss you all incurred,may the fond memories you have gathered over the years be part of your healing process. May God bless you all! We were sorry to hear about Bud. Our thoughts and our prayers are with your family. you were always a kind, loving, friendly, giving and fun man. i have lots of memories to hold near to my heart, like the night we were at mom and dads singing all around the water tank……. it is going to take a long time to get used to not seeing a judy without a bud…but the whole family will be here for her, shane and kenny. i love you with all my heart and i am glad i got to tell you that. we will miss you but will never forget you. take care of nan up in heaven until we all get to be together again. Shane, Judy and family: So sorry to hear of Bud’s passing. Our deepest sympathy to all of you at this sad time. sincere sympathy to judy and the family . so sorry to hear that bud passed away ,can’t imagine seeing you without bud . you two were glued at the hip. bud loved to joke , it was hard not seeing that the past few months . he can finally rest in peace . sincere sympathy to the family. glad that little lincoln got to see his grampy before the very end . brenda and jim. Sympathy going out to you Judy and your family. Our deepest sympathy to Judy and family . Our thoughts and prayers are with you all. My deepest sympathy goes out to you and your family during this time of loss. Know the angels are always near you and those who are grieving, to whisper to them that their loved one “Bud” is safe in the hand of God. So sorry to hear of Bud’s passing, he will be missed. Sending our sincere condolences at this very sad time. Others care . So very sorry to hear of Bud’s passing. It was always nice to see his smiling face. Our thoughts and prayers are with you. So sorry to hear about Bud. Our thoughts and prayers are with you. The loss of a husband and father is never easy but one thing you will always have are memories. Memories keep the one you loved close to you in spirit and thought and always in your heart. So very sorry to hear of Bud’s passing.my thoughts and prayers are with you. words cannot express how sorry we are for your loss. Bud was a wonderful man, and will be missed drinking coffee and making us laugh at Subway. Talking with Bud the past months have been great. DEAR JUDY AND FAMILY,SORRY TO HEAR OF BUDS PASSING.OUR PRAYERS ARE WITH YOU AT THIS SAD TIME.MAXINE AND TONY. So sorry for your loss are thoughts and prayers are with you. Judy and family. So sorry to hear about Bud. My prayers and thoughts are with you all at this time. At least Bud is out of pain now. If there is anything I can do for you, please let me know. Dear Judy and family….So sorry to hear of Bud’s passing. Our thoughts and prayers are with you during this difficult time. Bud will be missed by many. Take care. Judy , Shane & Kenny– We are very sorry to hear of Bud,s passing .May your memories console you as you adjust to his passing..God Bless all. Judy & Family: We are so sorry for your loss…please know you are in our thoughts…cherrish the memories!!! Judy, Shane & Kenny : So sorry to hear of Bud’s passing. Our thoughts and prayers are with you. I was so saddened to hear about your loss. It was an honor to assist you in a small way to care for Bud. You did an amazing job in providing Bud with the best care possible . Thank you for welcoming in your home and please know that everyone is thinking of you and your family. You have your memories and someday you will be together again. Sorry to hear of Buds passing. May God give you comfort through this difficult time. So sorry to hear of Bud’s passing. My thoughts and prayers are with you through this difficult time. Bud was a great man and to whoever knew him had the honor of his compassion and friendship. May you find peace in God to help you through. My heart goes out to the family during this trying time. Strength and love I send to you all. Dear Judy and family: We are saddened to hear of Bud’s passing. He will always be remembered for the twinkle in his eye and friendly smile. Lean on each other for comfort and strength. Judy & family sorry to hear of your loss,I was shocked wnen we heard sure going to miss him. but we have a lot of good memories of him. He’s resting in peace now. God bless you and your family. Judy and Family ,we are so sorry to hear about Bud’s passing, you are all in our thoughys and prayers. Judi,Kenny, Shane, & family.My thoughts & prayers are with you all at this time.Bud was such a great guy & a friend to everyone.Keep your memories close.He is another “angel” watching over his family.Someday you all will be together again. Judy , Kenny, Shane & family. Our thoughts are with you at this time of great sorrow. We know it will be difficult but keep the momories close and it will help a little at this time. He will be missed by many. I am so sorry to hear of Bud’s passing,just know that we are here for you all.Sending hugs and prayers to help you get through the coming weeks. Judy and Shane, sorry for your loss. Hold on to the memories. So sorry to hear of Bud’s passing. Our thoughts and prayers are with you all at this sad time. Judy and family…so sorry to hear of Bud’s passing…In time I hope things will get easier.Take care of each other and cherish your wonderful memories ..
Judy, Shane & Family. So saddened to read of Bud’s passing ,this morning, in the Chronicle Herald. Sending my deepest sympathy to you all in your great loss. Keeping you in my thoughts and prayers. God has him now but you will always have the good memories. HUGS. Nancy. Dear Judy, Kenny , Shane and family: I am so sorry to hear of Bud’s illness and now his passing. It has been many years since we have seen each other through the Fire Dept. functions. Bud was one of the few gentleman in the department. May you find strenght and support from your family and friends at this difficult time. God Bless. Its never easy to say good bye to a loved one and its no secret how much Bud was loved! My thoughts and prayers are with you, Shane, and your entire family at this time. I know no words can ease you pain and grief right now but know that good memories and good friends are always there for you! Judy, Kenny and Shane: sorry to hear of your loss. Our thoughts are with you at this most difficult time. We are very sorry for your great loss and pray that God will give you the strength and comfort you will you need in the days ahead. Judy and family, My deepest sympathy to you all. We were so sorry to read of your Dad’s passing. Just wanted to let you know we are thinking of you and your family at this difficult time. Take strength and love from each other and keep his memory close to your heart. We were deeply saddened by the passing of Bud. He was a quiet person but was always sharing a joke or two with us. I am trying to write this without tears in my eyes, but it cannot be, for I am truly very upset. May God reach out and touch you in your time of sorrow and think of him only in good times. I am sure that will bring your own private smile of understanding. If there is anything we can do for you do not hesitate for we are only a phone call away? May God keep and comfort you. judy and family,although i have not seen you or bud for so many years, i will always remember the good times we had in the 60’s. Judy, Shane, Kenny and Family, Our thoughts and deepest sympathies are with you at this very sad time. I was very fond of Bud and will miss him and will forever hear him greeting me with “Hello Blondie”. Sorry to hear about Bud’s passing. He is pain free. Bud always talked about his trip home from Bridgewater with David. You are in our thoughts and prayers. So sorry to hear of Bud’s passing…I have many fond memories of time spent with your family. Sending you all our deepest sympathy. You are in our thoughts and prayers during this difficult time. We were so saddened to hear of your loss. Our hearts go out to you. Bud’s passing is certainly a great loss in the community. Please accept our deepest sympathy and our prayers. We would like to extend our sincerest condolences to you on Bud’s passing. We will keep you in our thoughts in this time of loss and may the memories of good times comfort you in the future. I am so sorry to hear of your loss. I am sure you have fond memories and they will help get you through the rough patches. TO JUDY ,SHANE ,KENNY AND FAMILY–MY THOUGHTS ARE WITH YOU ALL AT THIS SAD TIME!!! ONLY TIME WILL EASE THE PAIN YOU ARE ALL FEELING AND LOTS OF HUGS!!!! Our Deepest Sympathy to you during this very sad time. We will keep you in our thoughts and prayers. It was a special gift that we had Bud as such a close friend for so many years,We are going to treasure all the memories. My sincere sympathies to you all. Sorry to hear of your loss. Our prayers are with you all at this difficult time. Sorry to hear of Bud’s passing. My deepest sympathy to the family. Judy and family, Our thoughts and prayers are with you all at this time of great sorrow. Judy and Family: So sorry to hear about Bud’s passing. My thoughts are with you all. Judy, Kenny, and Shane – Bud will be missed by all that knew him. He always had a laugh and sparkle about him that made everyone love him. Draw on your memories to pull you through the tough days ahead. I guess God needed another special angel. Love to you all. Oh my gosh, I only heard of your loss yesterday and was shocked, to say the very least. Although Bud was one of your group I did not know, I am sure he will leave a huge “hole” in your lives for many years to come. Shane, I know what it feels like to lose your Dad, since mine went away just a while ago…..if you need anything, just call. Judy, although I don’t know what it’s like to lose a partner, I can only imagine the loss you feel. However, you still have the rest of your family for comfort and keeping your memories with you. Finally, Kenny, haven’t really “known” you for a while, but my heart goes out to you and your family as well. Judy, Kenny, Shane & family, so sorry for your loss. My thoughts and prayers are with you at this difficult time. Bud will be truly missed by many. I am so very sorry to hear of your loss. My prayers are with each and every one of you.I know what a strong family you all are and i know that you will be a great comfort and support to each other . God Bless all of you. Judy and family: I pray that your good memories help you through the days ahead. May God bless! We were so sorry to hear of Bud’s passing. Our thoughts and prayers are with you at this very difficult time. Judy, Kenny, Shane and family; Our deepest sympathies are with you at this time. Bud was a great guy and will be missed by many. Take care; our thoughts and prayers are with you. Thoughts & Prayers are with all the Family. To Kim,Brian,Slyvia,Dougie, Judy and family: Our thoughts and prayers are with you at this sad time. Judy, Shane and family, So sorry to hear of Bud’s passing. You are all in our thoughts and prayers. 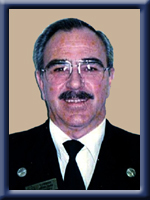 On behalf of the Honourary Firefighters “Old Smoke-Eaters Club” of the Bridgewater Fire Department, I ask that you accept our sincere sympathy on the passing of our friend and colleague, “Bud” Huey. May it comfort you to know that our thoughts and prayers are with you at this difficult time. Dear Judi and family: So sorry to hear of the loss of your dear husband and father. It seems that I saw you together in Bridgewater only a short time ago. May God wrap his arms of love around you and give you his comfort and peace at this sad time. We were very sorry to hear of Bud’s passing.Our thoughts and prayers are with you. hey jude so sorry to hear about your lose my heart goes out to you and your boys .bud will be missed. We are so sorry to hear about Bud’s passing. Sincere condolences are extended to his family at this time of bereavement. Judy and family,I am so sorry for your loss, my thoughts and prayers are with you all. My thoughts are with you at this sad and difficult time. We were so very sorry to hear of your loss, our thoughts are with you all at this time. Life is so very, very precious and so very very short. Judy and family.Walk strong in your faith and count the blessings you have with your family.I offer you sincere condolences.Please remember our talk. Dear Judy and family, So sorry to hear this sad news. Judy, Kenny and Shane. It’s been some time since we’ve seen each other, but, we have great memories from the past for sure!!! (Barrie, Ont., Canada) and the last time we were in Nova Scotia. To let you know we share your sorrow and the hurt in your hearts. Wishing you comfort and solace in knowing love growns on. Bud was a terrific person! When we leave this earth, the love that we’ve received remains behind to light the lives of those we touched – each memory a candle burning bright. Wishing you confort in knowing how brightly love shines on. My deepest sympathy to all of you. Bud was a great person and will be sadly missed by his many friends. The large number of condolences on here just confirms that he was very well liked by so many people. Judy, Shane, Kenny and family – Our sincere condolences in the loss of your loved one. Our thoughts and prayers are with you all. We were so sorry to hear about Bud. You will need to carry on. I was very sad to hear about Bud. In time it will get better and you will be able to smile and laugh again. Until that time comes please take comfort in knowing so many others care…..Sincerely Wanda Horton .